Family Volley: TEEN WEEK: Raising Teens- "Age of Opportunity"
TEEN WEEK: Raising Teens- "Age of Opportunity"
It's TEEN WEEK here on Family Volley! All week we will be talking about those tough adolescent years, with tips and tricks to not only surviving, but THRIVING! You don't want to miss it! Just when we think the "two's" are terrible, a parent will argue that it doesn't hold a candle to a 15 year old in the middle of puberty. And with adolescence lasting longer than ever before, it's time to give this stage of life more attention. To kick off Teen Week I want to introduce you to the best book I have read on the subject. 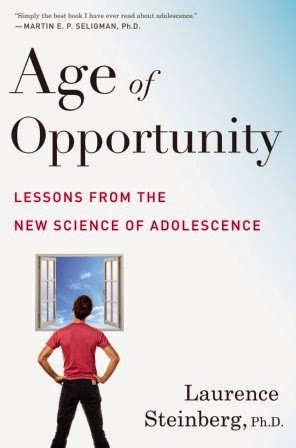 If you have a teen, know a teen, will have a teen one day, or work with teens, you need to read "Age of Opportunity" by Laurence Steinberg. The book, filled with years of research and findings, clearly explains how the adolescent brain works, which is a necessary place to start if we want to know how to parent them during those years. Steinberg explains that most of our understanding about adolescents are incorrect and gives us the truth about this time in life. By the time you are done, you will have a wonderful understanding of teenagers, how they work, why they do the things they do, and what you need to do to help them become successful adults. Not to mention what we should do in the heat of raising them when we don't think we can survive one more day. There are solid reasons to be concerned about our adolescents. American adolescents continue to underperform teens from many industrialized countries that spend a lot less on schooling. The US once boasted one of the the world's highest college graduation rates. It now doesn't even make the top 10. One in 5 American high-school seniors abuses alcohol at least twice a month. Nearly one third of young women in the US will get pregnant at least once by age twenty. The US leads the industrialized world in teen pregnancies and STD's and ranks near the top in adolescent abortions. In 2011, nearly one-third of the women who gave birth had never been married. Adolescent obesity is three times more common now than it was in the 1970's. You will not only find solid research, but solutions. As we head into Teen Week, here are a few understandings that you need to start with. Keep these as your foundation. The rest of the week will build on, and add to them. By the time we are done, you will have a game plan to use for your teenager. First, adolescents is just as important as the early years in terms of the potential impact of experiences on the brain. A teenagers brain is plastic (Steinberg, 2014). It can be altered by experience. What happens during these crucial years will affect the rest of their lives. Second, children are maturing earlier than ever before. As parents, we have to be prepared before they are. Third, we want to be authoritative parents. Demonstrating a good mix of warmth, firmness, and support. Forth, we can't love our children too much. There is no harm in telling them we love them EVERY day, in showing affection to them every day, in praising them every day. Those four truths will be the foundation for all we do here during Teen Week. Get ready to take some notes so you can strengthen the relationship with your adolescent. If you want to get your hands on the "Age of Opportunity" (and you do), you can find it on Amazon, IndieBound, and Barnes and Noble. What is the hardest part about raising a teenager? Wow! I am honored to be read this article here written by you. Teenage is really a timing of raising teens means "Age of Opportunity" and here very well explanation given for parents including how to understand teenagers, how they work, and what you need to do to help them become successful adults. I am dissertation writer and assisting those students who come to get professional dissertation help with plagiarism free at Dissertation Help UK, and I am appreciate you for writing such a best blog. Special thanks for sharing here such an informative post. My son turns 13 in January ... sounds like I need to pick this book up asap! great article. I totally agree. Everyone thinks that being a teenager is cool and they have no problems. Although adolescence is, to my mind, the most difficult one. Now teenagers get a lot of tasks at school, playing sports and hobbies and also have certain personal experiences. Therefore, many now are in a state of decontamination. I think that teenagers need to help, at least in education. You do not need to put pressure on the child, if he/she do not want to write an essay or do a job, you can buy essay cheap online from good service. And thus give a kind of time for their own business and rest. I do not call it to do it all the time, but sometimes in case of exception it is even useful.